Some knitters are natural designers. You know the type. Wendy Knits, for example, is a prolific sock knitter, and every pair is her own creation. Or two of my favorites: Connie from Physics Knits and Laura from Cosmicpluto Knits. Those girls have talent coming out of their ears. I’ve learned in the last week that designing does not come naturally to me. Under normal circumstances I don’t trust myself. At all. I never expect my projects to fit correctly, especially if I make changes to the pattern. But I’m doing it anyways, even if the perfectionist in me requires double and triple measuring and analyzing of my project multiple times daily. It’s a yet-unnamed vest. A garment. Something you wear that other people can see. SCARY. 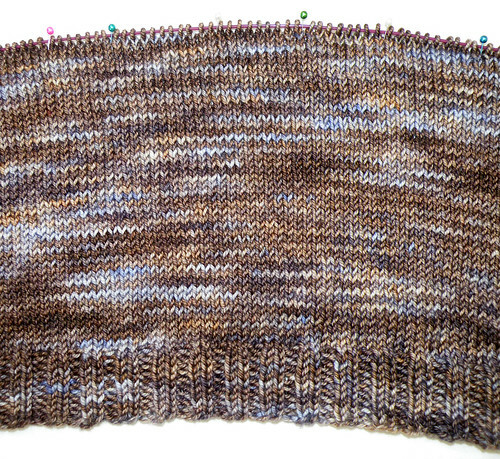 I’ve got 8 inches knitted so far, with the decreases for the waist shaping finished, and I hope to get another two inches done by the end of the day. I hadn’t planned on creating a pattern. But after looking through 21 pages of vests on Ravelry and not finding a single one that matched the picture I had in my mind I had little choice. Before I discovered Sundara yarn (which was in late 2007) she offered worsted and sport weight yarn, but discontinued them because she thought it was too expensive for the consumer. And due to popular demand, she brought them back at the beginning of this year. A friend of mine scored four skeins of sport weight merino during the February updates, passed them on to me, and that’s what I’m knitting the vest out of. The color is Flamenco Guitar, and I love it. 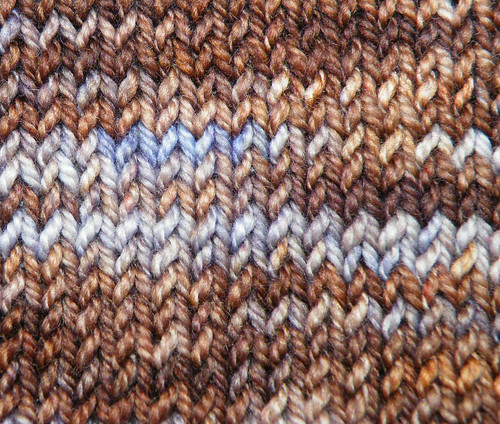 Brown with some blueish-purple varigation (it looks blue in the picture, but is much more purple in person). Hubba hubba. I had heard Sundara’s worsted and sport were incredible to knit with, but it’s even better than I thought. Very soft and squishy, and it knits up beautifully. Time to go. My fingers are itching to get back to knitting! You can figure this out Sweetie. You are a smart cookie! Beautiful yarn too! Feeling better? If anyone can work out a design from their head onto paper/yarn, it’s you. I’ve seen your projects and you do a lot of mods on most of them esp the garments. That takes designing mojo, and you got it. When you figure out the design and then sell your pattern, I’d like to buy a copy please. I can understand why you’d itch to get back to the knitting. It’s Sundara Yarn after all. My first order of Worsted Merino should come through soon – can’t wait!